 You’ve seen it on Instagram, Pinterest, and virtually every other social media feed where your favorite influencers are showing off their creativity with liquids. Fruit and herb infused water, or “detox water”, has hit critical mass. Cucumber water. Strawberry Blackberry Basil Water. Watermelon Citrus Mint Rosemary Asparagus Water. Not quite sure about that last one, but you get the idea. The possibilities are endless. And like all the other diet fads and detox regimens these days, this DIY infused water comes with all sorts of health claims. Clears skin. Flushes the kidneys. Relieves indigestion. All of these effects may actually be true! But it’s most likely NOT because you steeped some organic raspberries and fresh thyme into that awesome yet overpriced infusion bottle. Quite simply, you’re drinking more water. Like what I did there? Well, the point is, it’s all just better tasting water, for the most part. Let’s not delude (or dilute?) ourselves into thinking that adding fruits, herbs, or even vegetables is going to shortcut our daily requirement of roughage. There are no shortcuts, people. Sure, there may be some leakage of triterpines from your rosemary sprig. Or maybe tiny amounts of curcuminoids from your freshly sliced turmeric root. But it’s still 99.99% water. More elastic skin: although the jury is still out on the direct relationship between hydration and skin elasticity, or turgor, common sense dictates – you are what you eat, AND drink. For a quick test on your own skin, try the snap, pinch, and pout trick. How hydrated are you? Cleanse toxins: proper hydration makes for all kinds of regularity, including the kidneys’ ability to filter waste from the blood and turn it into urine. With long-term dehydration comes waste buildup, kidney stones, and urinary tract infections. Yowza! Fewer calories: calories come in many forms, but sugar is the biggest contributor of “empty calories” in many carbonated drinks, with average counts in soda starting around 100+ calories for 12 ounces. Low sugar: it’s well documented that sugar turns into fat, specifically fructose, which makes the brain resistant to leptin, the hormone that signals the brain when the body is “full” (2); less sugar, less fat! 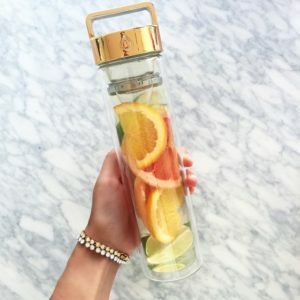 No chemical flavors or preservatives: when your color and flavor from fruits and herbs is infused on the spot, there’s no need for caramel coloring, phenylalanine, or sulphur dioxide to keep your water from spoiling; that said, make sure to drink within a few days (because it WILL spoil). Okay, let’s give credit where it’s due. There are SOME benefits to adding a certain fruit to your water. Polyphenols, the compounds in plant sources known for their antioxidant properties, need to be extracted so they can be bioaccessible and potentially bioavailable. (3) Considering most fruits and vegetables can’t easily be extracted into water without some fancy contraption, that leaves one viable candidate with a myriad of possibilities. Citrus. 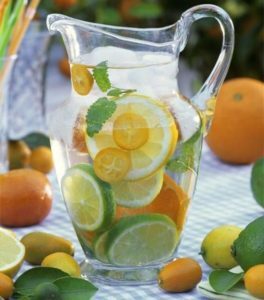 Not only is citrus versatile in its flavors, but it’s also loaded with nutrients AND easy to squeeze into water. Whether you prefer lemon, lime, orange, grapefruit, or any of the more exotic varieties, water infused with citrus is chock full of benefits. Especially if you’re not eating the whole fruit, citrus is a great choice when counting calories. The juice of one lemon comes in at a mere 12 calories (5), not bad considering all the other good stuff it contains. 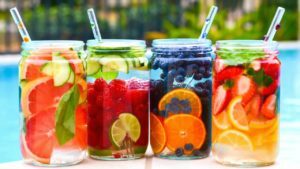 Infused water is sweeping the social media feeds these days with beautiful pictures and unproven health claims, so sometimes it can be hard to separate fact from fiction. Although infusing water with sliced fruits and herbs won’t provide all the nutrients available in the whole plant, they will make water more palatable so you can reap the benefits of better hydration. 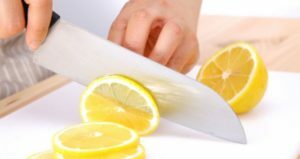 Also, squeezing certain fruits like citrus varieties will unlock more of their potential than simply slicing them. Whichever method you prefer, preparing infused water can fun, easy, and a great conversation starter. And now that you know some of the real #alternativefacts, feel free to spread the good word on your Twitter feed.